When commodity producers talk down the market you know prospects really aren’t very good for a price rise. Iván Arriagada, chief executive at Antofagasta was interviewed by the Financial Times while at the recent LME week and is quoted as saying Copper will continue to lag behind as other commodity prices rebound, adding the market is likely to remain oversupplied for at least the next three years. While demand for copper in China will grow at around 3% next year, that growth will be outweighed by oversupply. Chinese demand this year has been bolstered by a surprise stimulus boost early this year but many are expecting that to fade by Q2 next year resulting in a surplus of 192,000 metric tons in 2017, up from 185,000 mt this year, according to Reuters. Although prices are near year-highs, at least since March, imports of copper by China fell this month to their lowest since February of last year and the domestic market remains at a discount to the international market. The current increase in prices has caught the market by surprise (but not us). Copper hit a 15-month high last week after powering to $5,443 per mt, not on some sudden strong fundamentals, but on speculator buying. 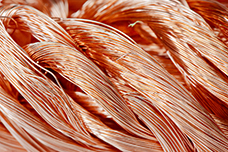 What’s driving the current surge in prices appears to be a disconnect in the copper market. ‘Refined copper is said to be broadly in balance, the International Copper Study Group and the International Wrought Copper Council both estimate that the refined market is in balance, a position ironically supported by the London Metal Exchange and Shanghai Futures Exchange which has seen almost unprecedented rises and falls in inventory this year. Yet, at the end of October, the net year to date movement in all global exchange copper stocks (across the LME, SHFE and Chicago Mercantile Exchange Group warehouse systems) has been a rise of just 22,500 mt, in a global copper market of 23 million mt. Even so, current speculator enthusiasm aside, in a poll of analysts at LME week, Reuters found it hard to find anyone who was bullish about copper in the medium term or about the pace of infrastructure investment in China next year. Nearly everyone is quoted as saying they expect both demand, and hence prices ,to ease from about Q2 2017 onward. The expectation seems to be that surplus concentrate will make its way through to the refined market next year and that the two cannot exist as parallel universes indefinitely. Further out there are better prospects for copper. Capital expenditures have been slashed and for firms like Antofagasta and mining is all about cost containment at the moment. The firm has two projects involving expansion at its operations at Pelambres and Centinela, which could add 200,000 mt per year but the firm is on no hurry and has given a deadline of the end of next year to announce if it plans to proceed or not. Long-term grades are falling and potentially developments like electric cars are cited by producers as cause for rising demand but that is still some way down the line. As the FT points out, state-owned producer Codelco needs to spend $17 billion over the next four years just to maintain its copper output due to declines in the grade of copper extracted from its current mines. If those funds are not spent, the supply surplus will dwindle but for now it remains and so, too, will prices around current levels, if not lower in 2017. Tin Price Rally Cools Down, When To Buy?